Almost 24 months ago, in response to Canada’s announcement of a national IP strategy, both Jim Hinton and I called for Canada’s need to move towards a more innovative intellectual property strategy. In our discussion we focused on the dismal amount of IP our research institutions and companies generate in relation to the rest of the world, and suggested approaches to consider. At that time, CIPO’s / Statistics Canada’s estimation was only 9% of innovative SME companies in Canada had an IP strategy. One of our suggestions was to consider a Patent Collective, formed to help companies address the IP gap we have when compared to the global IP environment we need to operate in. The importance of this topic is a critical discussion to have: In the past years there has been additional moves to help shift Canada’s IP position, but the ability and pace to enact change is similar to a David vs Goliath story compared to the larger ecosystem . In reality countries like China and the US have increased patent filings in areas such as Artificial Intelligence, and IoT, where other countries investments of combined IP + research have not kept pace. To support this example view, not a month seems to go by without yet another report from entities such as WIPO, who release data or press releases on how the “AI IP boom” is expanding. 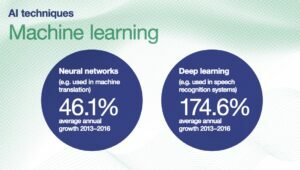 For example, WIPO’s recent AI trend report indicated the CAGR of machine learning patents ranged from 46% to upwards of 174%, with leaders such as IBM and Microsoft as having AI portfolios in the range of 8200 and 6000+ inventions respectively. 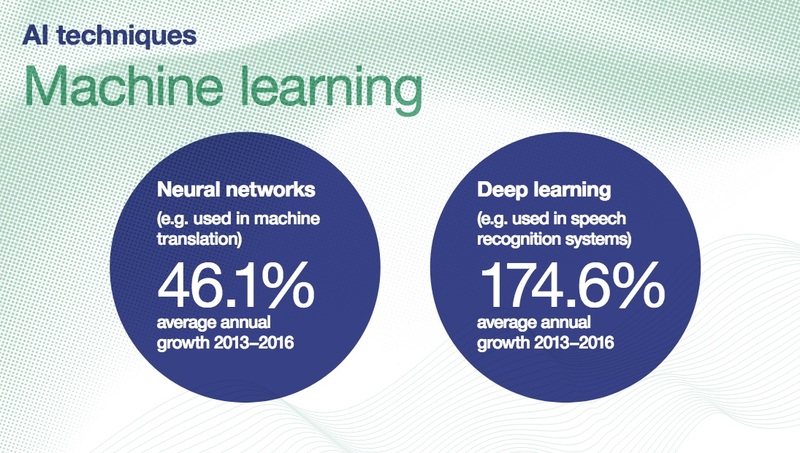 While AI is only one example, there are other technology sectors where similar trends are playing out. Yet regardless of the trend the fundamental issue seems to remain for Canadian companies – IP attention by our SME’s appears lacking in comparison to the world growth rate. In other words: We seem to do relatively very little in IP, and even less “IP strategy”. Two years ago I wrote that few Canadian SME’s exporting at key conferences such as CES appear to have very little in the way of a developed IP strategy, in the range of 10%. The data I compiled is slightly higher for 2019 CES, but not substantially. This estimate matches with Statistics Canada’s figures, which is a concerning trend because the same Statistics Canada report suggests IP is a component of successful SME exporting, finding SME’s in Canada who have formal IP are 2 to 4x more likely to export, and 60% more likely to be high growth. To support this, a study on SME’s in Europe out of Paristech Mines suggested startups were 3x more likely to be successful if they had 1 patents, and 5x if they had a number of patents. In other words: We seem to do relatively very little in IP, and even less “IP strategy”, despite IP holdings and IP strategy being linked to SME success. As a component of the national IP strategy, Canada’s recent announcement towards operationalizing a Pilot Patent Collective program may be just the pilot tool to help SME’s address or jump the “IP gap” they currently face. With IP linked to SME success, we now have the opportunity to support our innovation and SME research investments with similar IP based initiatives.